Say Bunny one more time…. Having missed the Bunnahabhain boat for most of my whisky life I have found myself in preparation for this review not knowing too much about this Islay distillery. I have tried the 12 some time ago and remember very little. A barely smoky, salty malt. In fact, the most prominent factoid available in my mental arsenal is that Bunnahabhain distills not just one of the lowest ppm malts in the industry, but distills a low 1-2 ppm on Islay. If this is due to distilling tradition or rebellion I do not know, but I’d like to think it’s because they wish to do their own thing despite the peaty reputation of their famous island. I can respect that. Nose- Fruity and big. Nice toffee with some salty sea air hovering overhead. Doughy and yeasty, strangely. Sherry raisins. Taste- Salt again with the toffee sweetness resembling a syrupy feel. Oak. Full mouthfeel. Very active and lovely. Finish- Vanilla and sherry wine. Brandy like. Leathery and old oak. Medium length. Comment- If this is the only Bunnahabhain I ever taste, that’s fine with me. 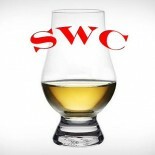 Good old fashioned sherried Scotch with great balance and aged flavors. Recommended.